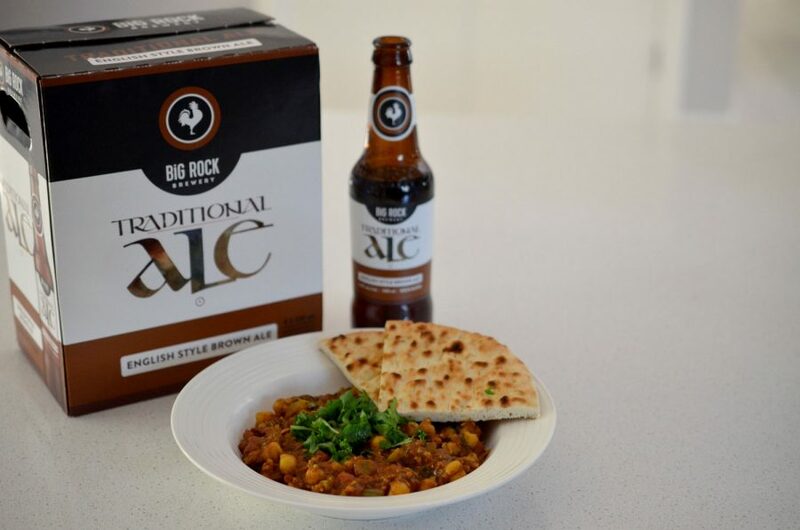 Chana Masala – not what you would expect for a pairing with Big Rock Traditional Ale, right? Well, guess what? It’s fantastic. The tomatoes and spices bring out the malt and caramel flavours in the beer and make it even more delicious! Plus, this recipe is great for those “I forgot to pull something out of the freezer for dinner” nights. All items that can be found in your pantry or your spice rack, this dish is super easy and quick. You’ll be ready for dinner in half an hour – and hopefully you’re beer will cool fast enough to go with it. In a large, deep saucepan saute the onions with the oil over medium heat. Add the cumin, coriander, chipotle, and turmeric. Saute until onions soften, about 5-10 mins. If it starts to dry out, add more oil, a tsp at a time. Add the ginger and garlic and saute 1-2 mins more until fragrant. Add 1/2 cup of cilantro and saute and additional 2-3 mins. Add the tomatoes (including all of their juices), chickpeas and sugar. Bring to a full boil and reduce the heat to keep at a simmer for 20-30 mins. Stirring frequently, summer until sauce is thickened and liquid is reduced by half. Add the garam masala, salt and pepper to taste. Adjust spices (any of those listed) based on your taste. If you like it more garlicky, add garlic, if you like it spicier, add chipotle. Serve immediately with naan bread and Big Rock Traditional Ale. Top with the remaining cilantro.